If you want to talk about crossing bridges, emigrating, people ranging in age from 18 to 25, possessing an heirloom for generations, a room that looks out onto the ocean, handing someone paper, extraditing criminals, advancing wages, or bouncing a check, you'll need the indispensable 渡! Find out about all these structures, as well as a deadly form of transit that some Japanese once used! p. 2: Updated the Sears link. p. 24: Edited the translation of the text in the sign, as well as the vocab. Also added an explanation of 谷から谷へ. p. 6: Removed a broken link and changed the vocabulary for a sample sentence to reflect that the 年 in 538年 is not a counter. Then changed p. 11 to show that the 年 in 20年 is indeed a counter. p. 9: Changed the spelling of 皆 from みんな (a colloquial yomi) to みな (the official way of writing it). 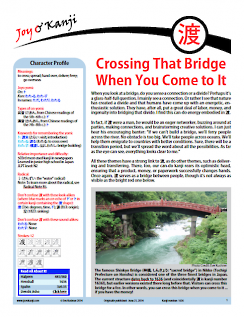 p. 13: Changed the link for Konpira Shrine and slightly revised the definition of 渡り廊下. June 21, 2014: Originally published.